Children in Dekoa, Central African Republic (CAR). The United Nations Multidimensional Integrated Stabilization Mission in Central African Republic (MINUSCA) today strongly condemned repeated assaults against its peacekeepers, in the wake of two attacks over the past five days. According to the Mission a logistics convoy secured by its Pakistani contingent was attacked yesterday by a group of armed individuals, some 20 kilometres from Dekoa, in the prefecture of Nana Gribizi, which is in the northern part of the country. The peacekeepers reacted quickly and routed the attackers. Weapons were also recovered, said MINUSCA. This attack comes three days after that against a convoy from Bambari secured by the Mauritanian contingent of the Mission was attacked between Grimari and Sibut, wounding five peacekeepers. According to preliminary information, a group of an estimated 50 armed elements opened fire on peacekeepers and civilians while they were trying to repair a vehicle of the convoy. Strongly condemning these “cowardly and irresponsible actions,” MINUSCA also urged an immediate end to such attacks against its ‘blue helmets’ and mission premises. Further, the Mission denounced any and all provocative statements wrongly accusing its contingents and stressed that such allegations, some of which have religious connotations, can cast doubt on the impartiality of its troops. 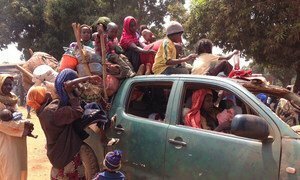 In the wake of a number of killings and attacks on civilians in the Central African Republic (CAR), the Office of the United Nations High Commissioner for Human Rights (OHCHR) has called on all actors in the country to exercise restraint and prevent any further escalation in violence.